The traditional hero may soon be out of a job. Forget about exploring new planets, collecting military intelligence and fearlessly rescuing disaster victims. If mechanical engineer Dr Mark Yim has anything to say about it, those tasks may soon become the territory of his intelligent, mutating robots. "On a new planet, underwater or in the rubble, who knows what you're going to find?" says the 33-year-old Yim. "It's the best way if you don't know what you're going to meet next." It's an exciting idea. If all goes according to plan, modular robots could enter unstable buildings after an earthquake to search for victims and then form themselves into a protective dome around the person. Crawling across a battlefield, shape-changing robots could collect sensitive data about troop and landmine positions without risking human life. Many would see this as a dream job. But Dr Yim is a scientist through and through. "For me, it's the actual device that I find interesting," he says cheerfully. What people decide to do with it is up to them." 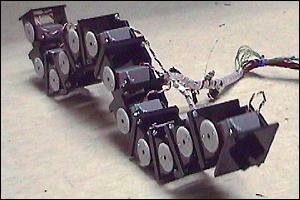 But building a robot that can tackle any terrain and respond to whatever it encounters is no easy task. In fact, it almost sounds like a sci-fi toy of a very futuristic film. "It's really hard - and really frustrating," said Dr Yim. I spend all my time trying to make robots do what humans do really well - adapt." Still, if anyone can crack it, it might be Dr Yim. As a Stanford University graduate student seven years ago, he launched an exhaustive study into the ways he might make robots move. The result was a sophisticated understanding of gaits that Dr Yim then began applying to his robots. Backed by a grant from the Defense Advanced Research Projects Agency (best known for funding the military forerunner of the Internet), he's refining his vision and has joined the world-famous Xerox Palo Alto Research Center (Parc). So far, he has been able to make prototypes form themselves into a wheel to crawl over flat ground, shift into the shape of a spider to tackle uneven surfaces and morph again into a snake shape that slithers through narrow spaces. Ultimately, he hopes they will "know" when to reconfigure themselves thanks to sensors that help the modules read their positions in relation to one another. For now - and for at least the next few years - they are radio-controlled, with a camera on the lead "bot". Dr Yim says there are two huge advantages to his robots. First, they are versatile. If one of the identical parts breaks in action, the machine compensates - just as a human would if he broke one of his five fingers. Second they are cheaper than hand-building unique robots. Since all the parts are identical, they can be mass produced. And because they are adaptable, one robot can do more than one task. Dr Yim is not the only one racing to build the first autonomous multi-tasking robots. Researchers at NEC Corp's research facility in Kawasaki, Japan, Dartmouth College in Hanover, New Hampshire, and Johns Hopkins University in Baltimore are exploring similar ideas. In fact, in theory, they should all be working together as the US Defense agency is also backing some of their research. But the world of science is a competitive place. "We keep saying we are going to get together to compare notes," says Dr Yim. "Maybe one day we actually will."